Thank you for visiting our K-5th elementary children’s ministry page! 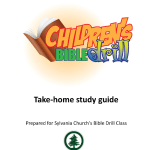 Below are a few links and resources we have for children here at Sylvania. We would love to work with you to help teach your children the Gospel of Jesus Christ and to grow in God’s marvelous grace! Let us know how we can serve you to that end! 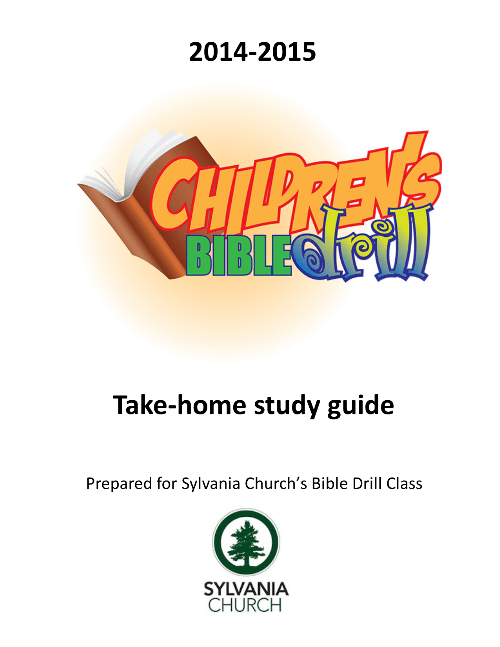 Take-Home Practice Guide: It’s not too late to enroll your children in Bible Drill! We meet each Wednesday night at 6 pm for lessons, training drills and games. Our first week was August 27, 2014. Download this Take home study guide and join us for a great time and a great skill! You can view the 2014 Take Home Practice Guide HERE. Weeks 1-4 Practice Reports — August 27 – September 17, 2014. Download HERE. Weeks 5-8 Practice Reports — September 24 – October 15, 2014. Download HERE . Weeks 9-12 Practice Reports — October 22 – November 12, 2014. Download HERE .